Avery stretched her arms wide to measure the girth of a massive cedar tree along Fernie’s Old Growth Trail. By her estimate the behemoth was “eight arm spans,” which measures roughly 10 metres around. Wow! 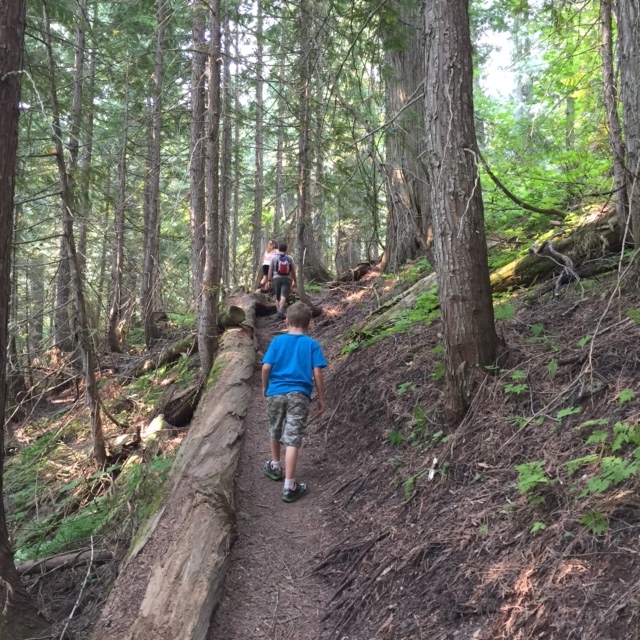 Avery and Blake hiking the Old Growth Trail in Fernie, B.C. 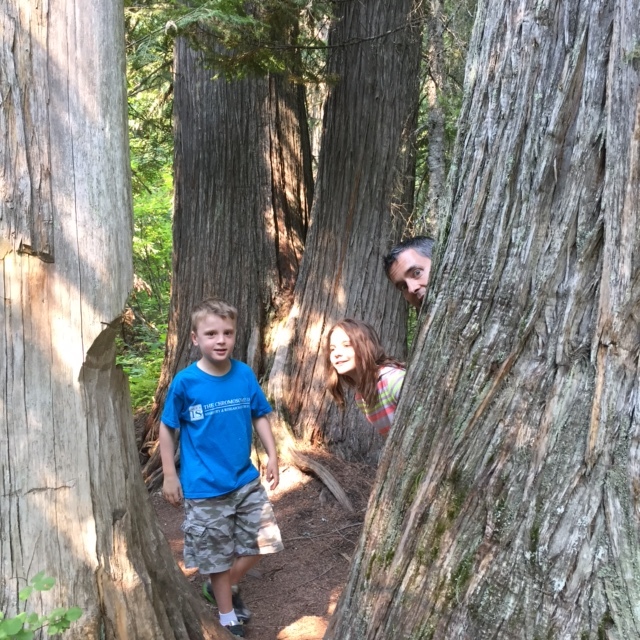 We certainly felt Lilliputian earlier this month while hiking through this forest of ancient Western Red Cedar trees, some that are estimated to be 800 years old. It’s a great hike for a hot day — the forest floor stays cool thanks to the shade provided by these giants. 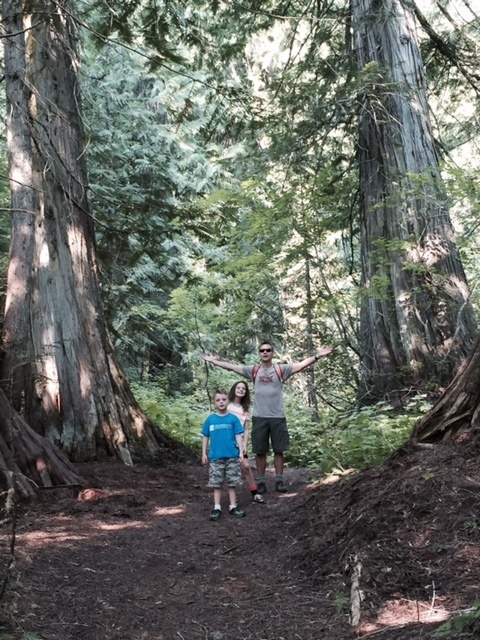 Tiny humans in a forest of giant cedars. 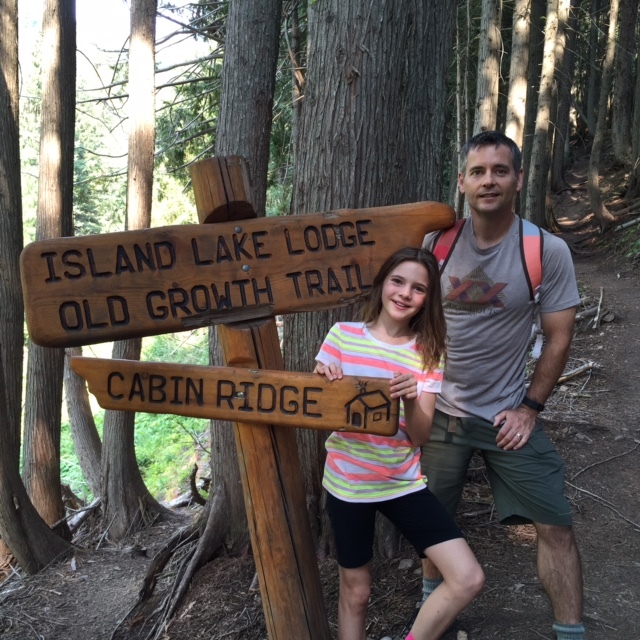 Bennett hikes up the shady Old Growth Trail to Island Lake Lodge. The trailhead is located at the 4-kilometre mark on the road that leads up to Island Lake Lodge. The path is well-marked and a gentle ascent, gaining just 250 metres as it climbs four kilometres to Island Lake. 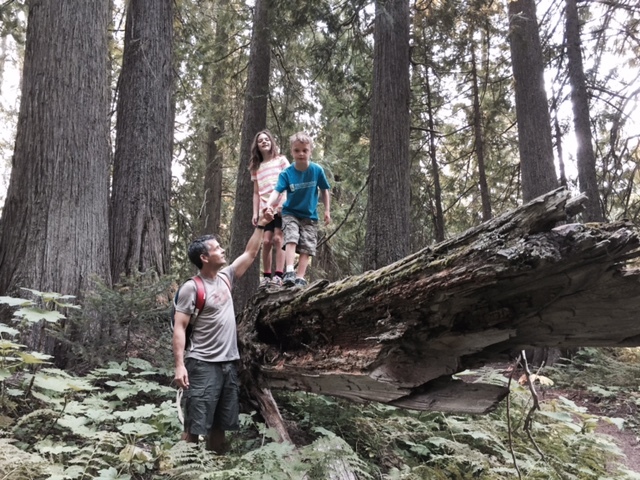 Balancing on a fallen tree… with a little help from Daddy. I was worried the kids would get bored or start complaining after the three-km mark, but there were enough bridges to cross, fallen logs to balance on, and old growth trees to hug that it never lost their interest. It took us about 90 minutes one way, including a snack break. (Blake jogged back down the trail to get the car and come pick us up at the lodge after the hike.) 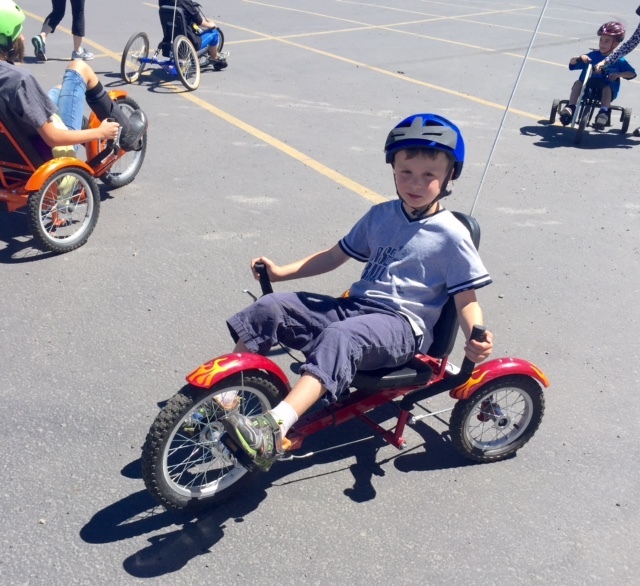 It’s a definite do-again — perfect for kids! Peeking out from behind a very old Western Red Cedar. 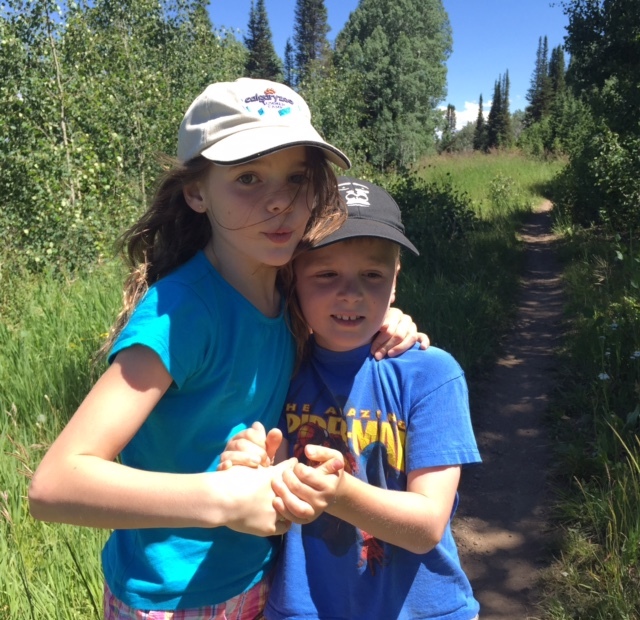 More than two years ago, before the Calgary flood, one of our favourite things to do as a family was to walk the trails in the Inglewood Bird Sanctuary. In summer we’d look for ripe Saskatoon berries, in fall we’d admire the colourful foliage, and in winter we’d appreciate the stillness save for the chatter of chickadees. In all seasons there was wildlife, notably deer, and occasionally we’d see muskrats or a bald eagle. 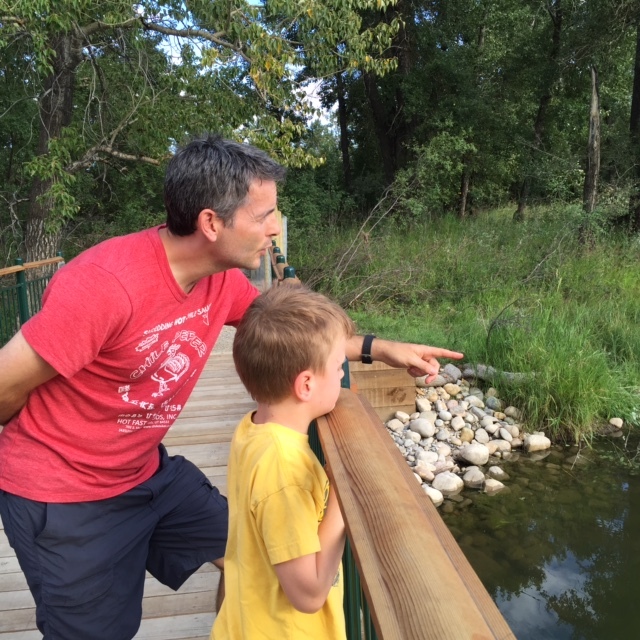 Blake and Bennett spot ducks from a new bridge at the recently reopened Inglewood Bird Sanctuary. 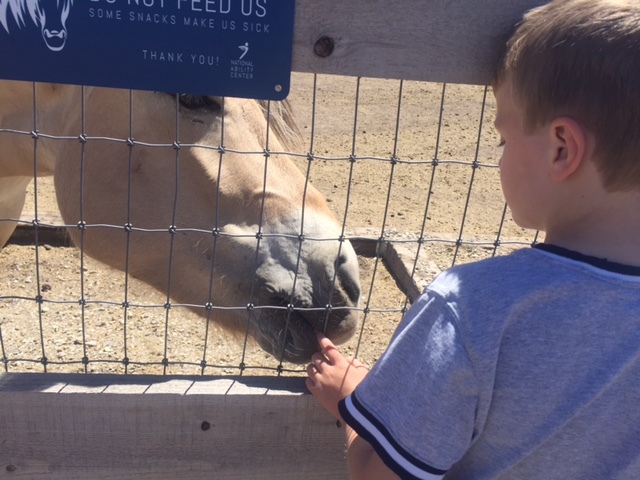 For the past two years Bennett would ask, “The bird sanctuary will be closed forever?” It began to feel like it. So we were thrilled to return from vacation on August long weekend and find out our old stomping grounds had been (partially) reopened. 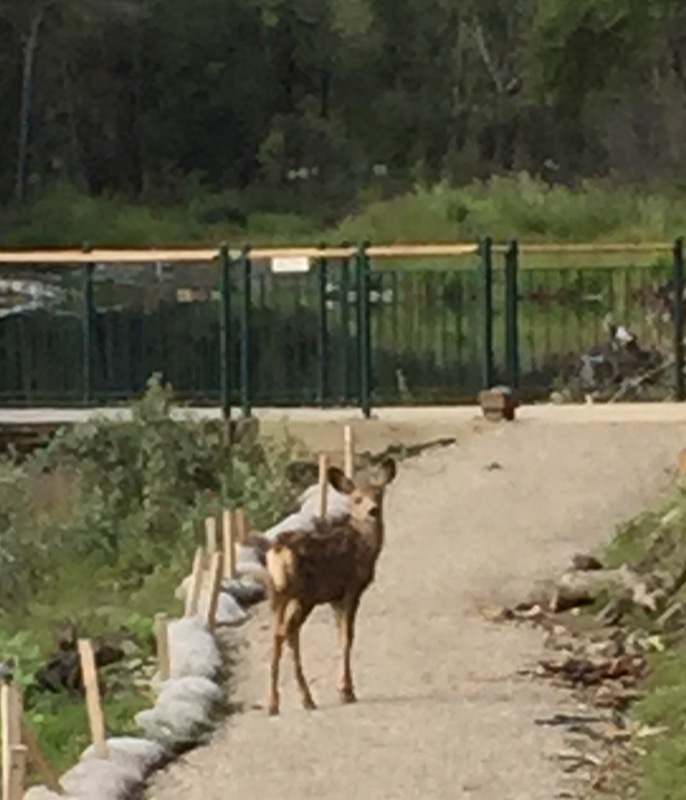 Not all of the pathways are ready for foot traffic — the flood did a number on the trails and infrastructure like bridges and viewing platforms — but our favourite loop that meanders past the Colonel Walker house, across the lagoon over two new bridges, and around to the main rehabilitated bridge, is once again open. We walked there on a recent evening to check it out. Peaceful evening inside the Inglewood Bird Sanctuary, which has finally (partially) reopened after the Calgary flood. We immediately spotted several fawns walking in the brush on the other side of the lagoon, their mother grazing not far away. Then, we saw an enormous great blue heron perched atop a fallen log. We got a good look and then he took flight, his enormous wings beating the still air. 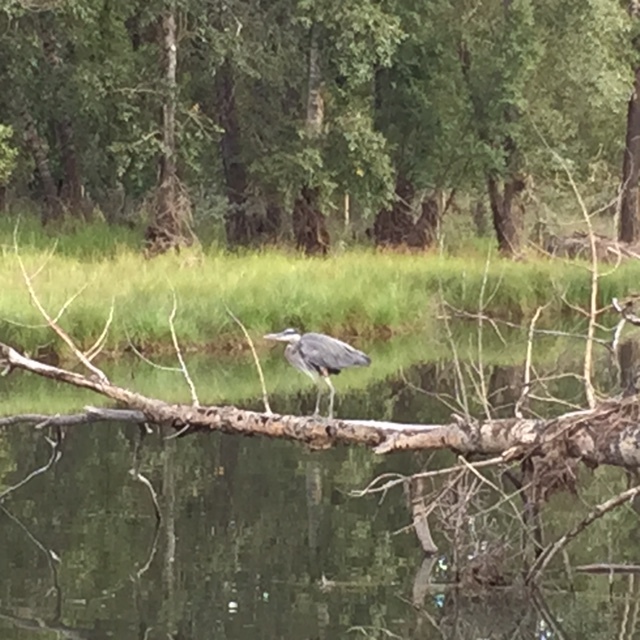 This is why it’s a bird sanctuary — a great blue heron rests atop a fallen tree. On the other side of the lagoon, where the forest is thicker, we saw what looked like numerous trails leading from the water into the trees. On closer inspection we realized they are beaver runs and lead to trees that have been felled by the industrious critters, which have pretty much taken over during two years of free-range chewing. Have trees, will chew. 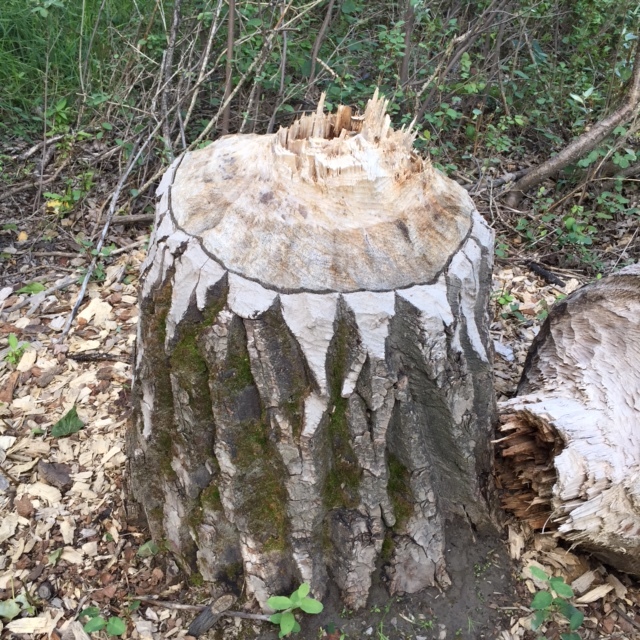 The beavers have taken over the Inglewood Bird Sanctuary. As we walked along the path we kept our eyes peeled for the fawns, and we were lucky to spot all four of them (! 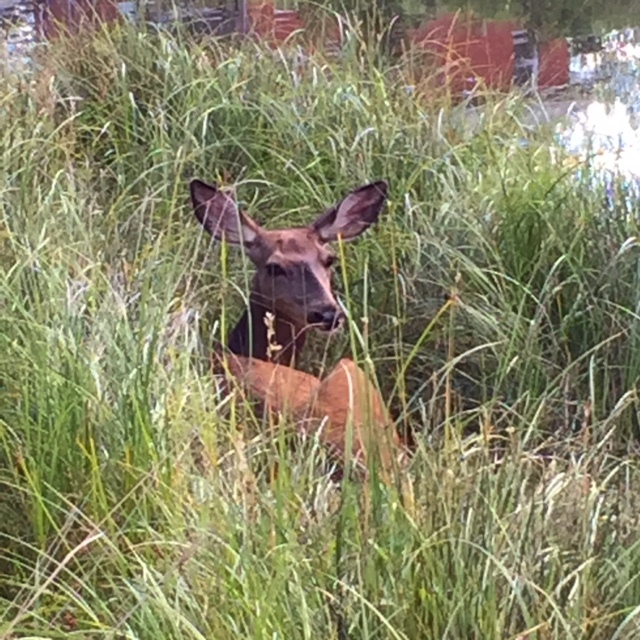 ), plus mama having a rest among tall grass near the water’s edge. One of four fawns spotted on a recent evening. Her babies were skittish, but mama deer is entirely non-plussed about sharing the bird sanctuary with humans again. In all, it was a special evening that reinforced why we love — and truly missed — the Inglewood Bird Sanctuary. Alberta has Drumheller and the badlands, Colorado and Utah have Dinosaur National Monument. There’s no world-class museum filled with dinosaur skeletons; instead, gorgeous coyote-and-roadrunner scenery, interpretive trails and an intact quarry with 1,500 exposed fossils, educate visitors about the prehistoric beasts that called this place home. 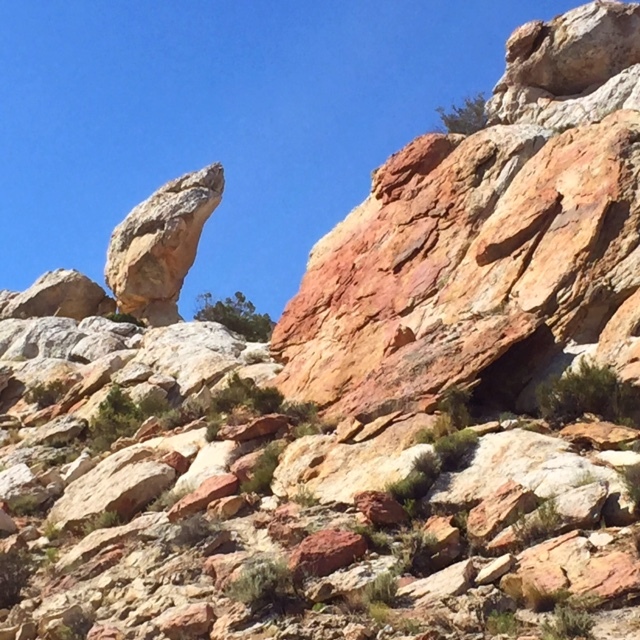 Gorgeous scenery is part of the Dinosaur National Monument experience. But almost more impressive than its former reptile inhabitants was the noticeable lack of primates (specifically, humans) visiting the monument. We had both the Quarry Exhibit Hall and the Fossil Discovery Trail to ourselves — a welcome departure from the crush of humanity at Yellowstone. 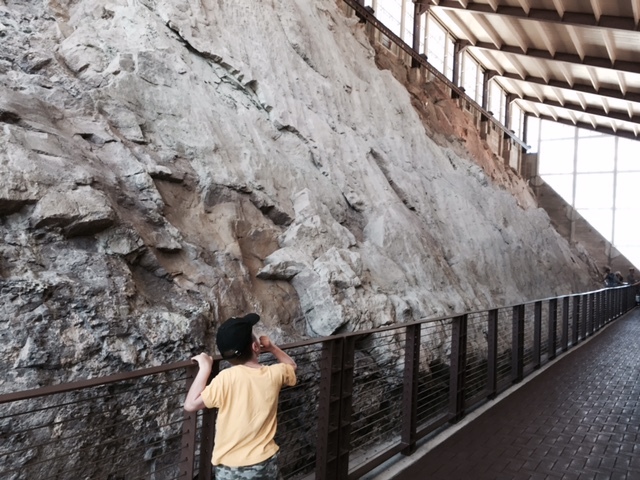 Bennett stands alone in the Quarry Exhibit Hall looking up at the giant wall chock-a-block with dinosaur fossils. Bennett has been to the Royal Tyrrell Museum a couple times and loved it, but he is absolutely terrified of the new animatronic dinosaurs that make up the Dinosaurs Alive exhibit at the Calgary Zoo. He refuses to set foot inside the prehistoric park, even though he is fascinated by the roaring T-Rex when he spies it across Memorial Drive from Tom Campbell Hill park. So, I wasn’t sure how the monument would go over. Turns out he, ahem, digs bones and fossils and seeing the beasts recreated in a lifeless fashion. What freaks him out is when skin is added and the creatures come to life. 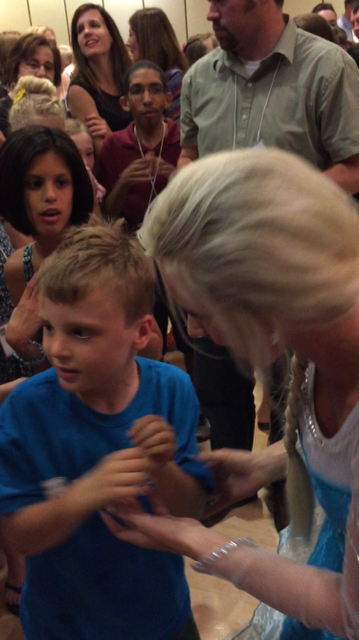 Since Dinosaur’s Quarry Exhibit Hall only showcases fossils and reassembled skeletons, we were safe. What’s cool about the hall is it’s been built over and around the original Carnegie Quarry, first excavated in the early 1900s, so you see original fossils that have been exposed but are still in the ground. And there are tons! Though many specimens were removed years ago, over 1,500 fossils from 10 species including allosaurs, stegosaurs, diplodocus, camptosaurs and brontosaurs, still remain in-situ. Dinosaur vertebrae and other fossils are easy to spot in the Quarry Exhibit Hall. Outside, more wonders awaited on the Fossil Discovery Trail, a 1.9-kilometre hike that winds downhill from the Quarry Exhibit Hall back to the visitor centre, passing more areas with exposed fossils and even some pictographs drawn onto rock walls. 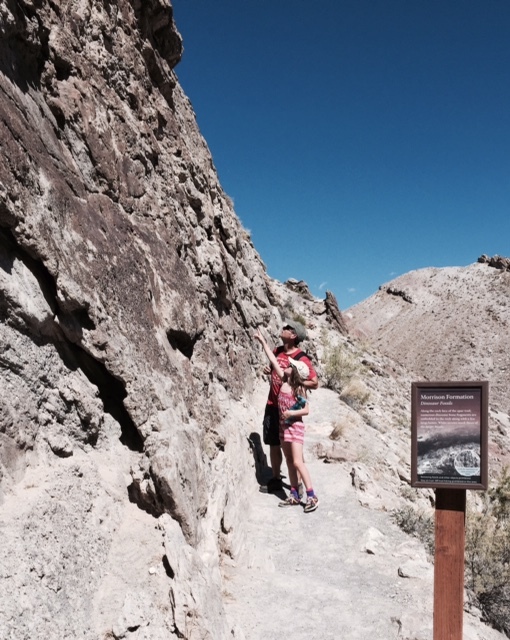 It’s a good thing we were trekking downhill as the temps outside were in the high 30s (37C)! 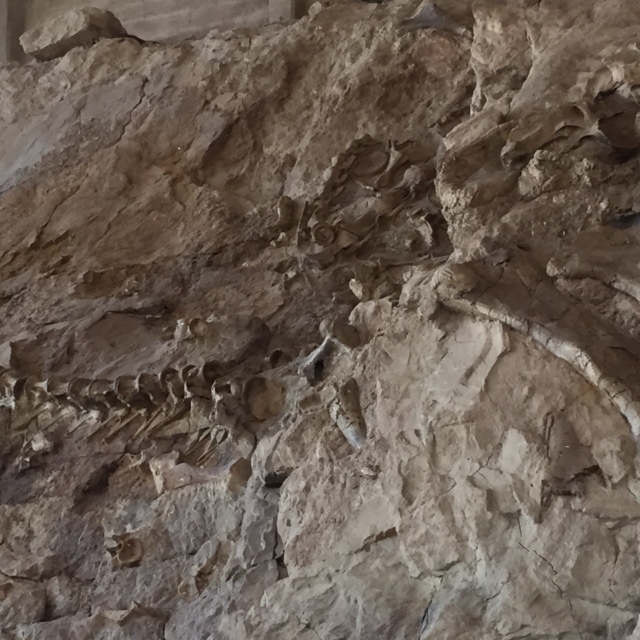 Spotting fossils along the Fossil Discovery Trail at Dinosaur National Monument in Utah. 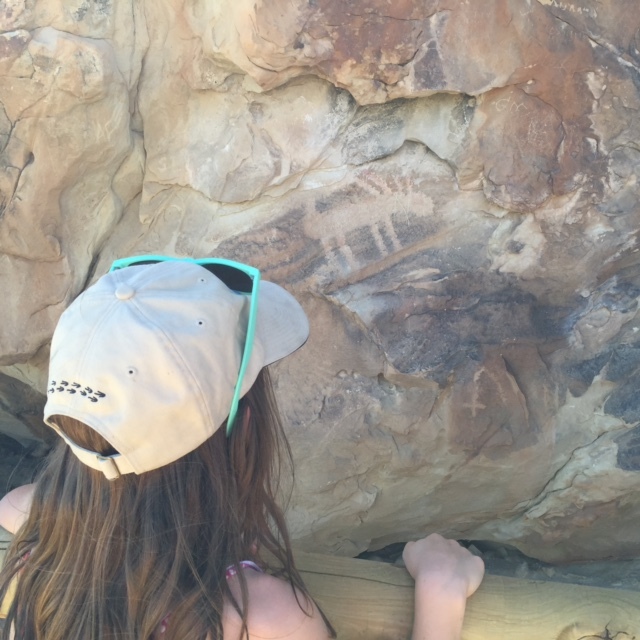 Avery spots a pictograph in Dinosaur National Monument. We had a great afternoon and it would have been neat to explore more of the park, but Park City and Salt Lake City awaited. 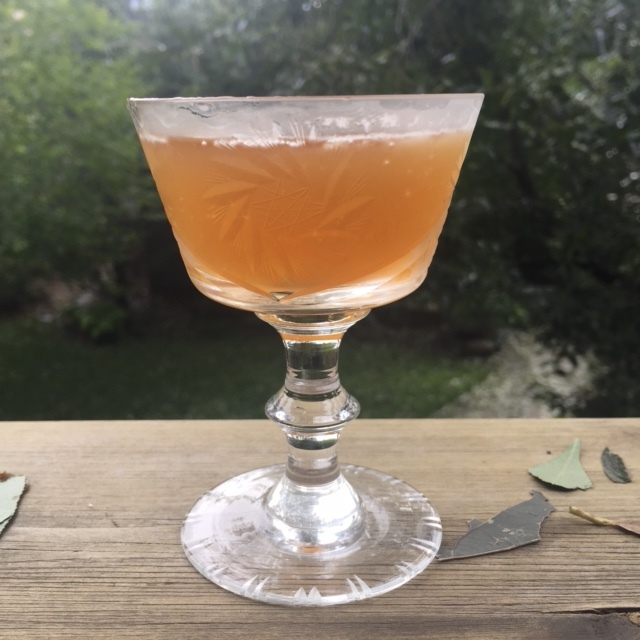 Here’s a rummy cocktail to get your weekend started. It comes courtesy of Jamaican rum Appleton Estate, which has just debuted new packaging and new naming for its core rums. New packaging and naming on the Appleton Estate Rare Blend 12 Year Old. What remains the same is the good stuff inside the bottle, still as smooth and robust as a golden rum should be. 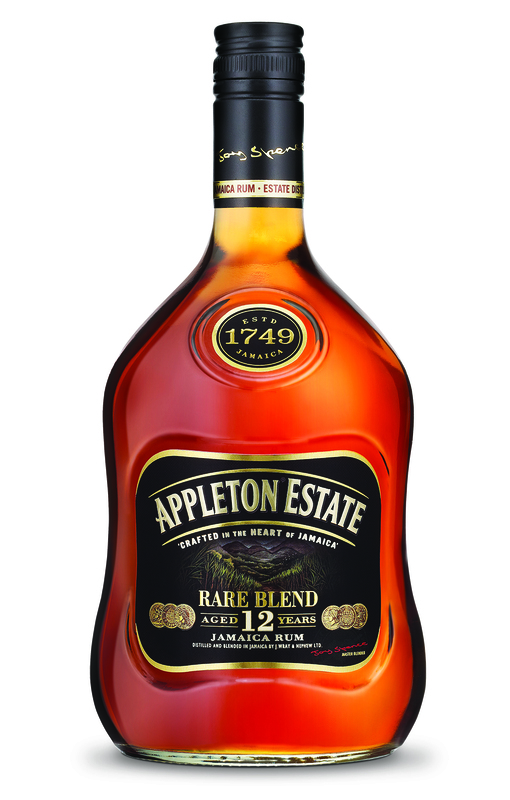 I sampled the Appleton Estate Rare Blend 12 Year Old, a sweet, fruity, woody number with hints of molasses and even coffee. I mixed it into two cocktails, the Estate Old Fashioned for Blake and a Jamaican Honey Soother for me. Initially Blake felt his Old Fashioned tasted too “rummy” (he likes them with whisky), but as the ice diluted the drink it grew on him. On the other hand, I immediately liked my Jamaican Honey Soother — which reminds me of my favourite African cocktail, the Dawa (whose name means “medicine” in Swahili) — but is made with rum instead of vodka. Sweet, tart and most of all, strong, this “Jamaican Dawa” will indeed cure what ails you. I’ve taken to calling this drink a “Jamaican Dawa” after my favourite African cocktail. Method: Combine ingredients in a cocktail shaker with ice. Shake well, then strain into a coupette glass and serve. Forty-five hundred kilometres, 11 Continental Divide crossings, seven hotel free breakfasts, seven restaurant meals, six fast food meals, five interstates, two national parks, one national monument and the World’s Largest Jackalope. Those stats pretty much sum up our two-week, five-state road trip from Calgary to Denver and Salt Lake City, and back again through Montana and Fernie. 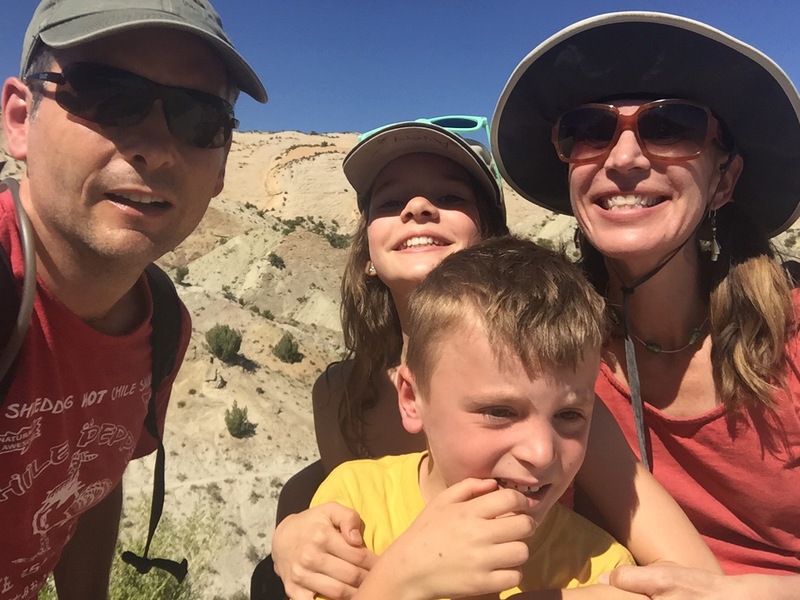 Family selfie at Dinosaur National Monument in Utah. It was an ambitious trip and a lot of time in the car for the kids. 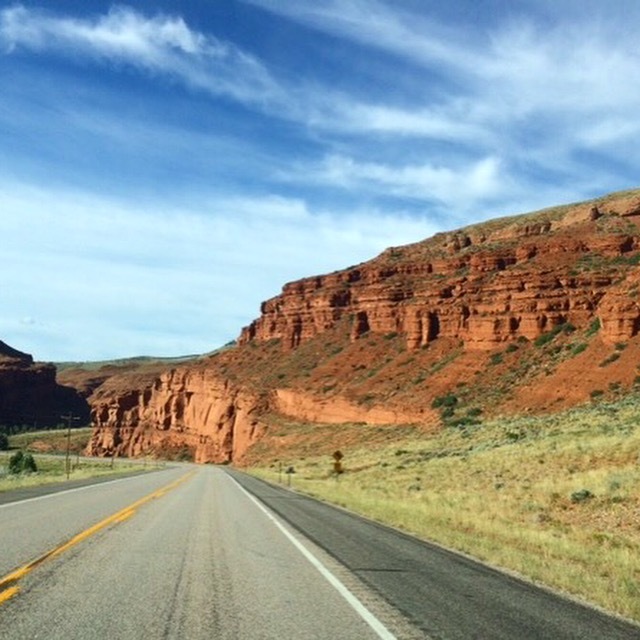 On “driving days,” of which there were seven, we averaged six hours on the road. The longest day, from Helena, Mont. through Yellowstone National Park to Dubois, Wyo. put us on pavement from 7:40 a.m. until 6 p.m. with numerous stops in between. En route we listened to playlists, let the kids watch movies and looked out the window at the ever-changing landscape, from mountains to geysers to badlands to scrub to prairie to mountains again. This was snapped through the windshield by Blake in Wyoming (note: he had just cleaned off all the bug guts from the window at a gas station, hence the clear view). To make the driving part more engaging we played the license plate game, where you try and spot plates from all 50 states and 10 provinces (we didn’t see any territories). Avery took to drawing a symbol to represent each state; for example, a dollar sign ($) for Nevada, a polar bear being bitten by a mosquito for Manitoba, a cowboy hat for Texas. Since there are some states we know next to nothing about (I’m talking about you, Maryland), we just kind of guessed (Maryland got a hospital). Also, she kept pronouncing Missouri misery, so she drew a frowny face 😦 for that one. In all we saw five provincial plates and every state plate except Hawaii, Delaware and Rhode Island. 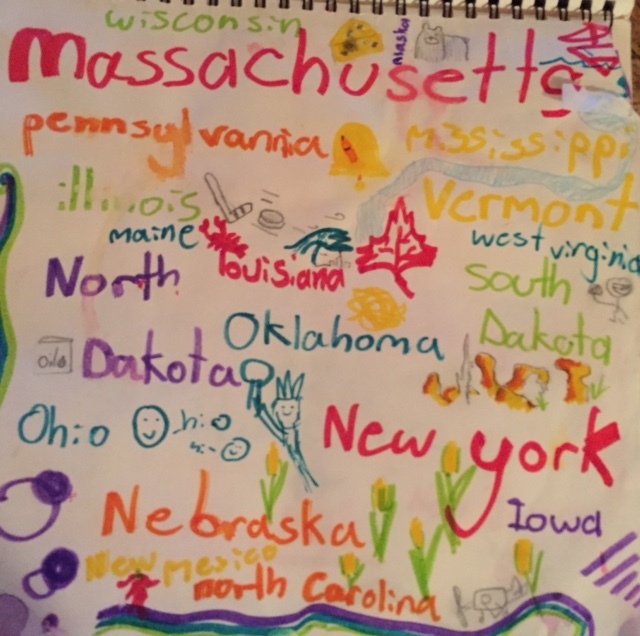 Avery drew symbols for each state we saw playing the license plate game. Nebraska and Iowa both got corn and Oklahoma warranted a tumbleweed (sorry). I think she learned a lot about the U.S., but not how to convert from Fahrenheit to Celsius. Another thing we noticed on the road was A LOT of road kill. This is kind of dark, but we started keeping a tally of the various dead animals along the way including deer, antelopes, porcupines, foxes, racoons and rabbits. Fortunately this macabre count was balanced by live animal sightings such as elk, deer and tons of antelopes. 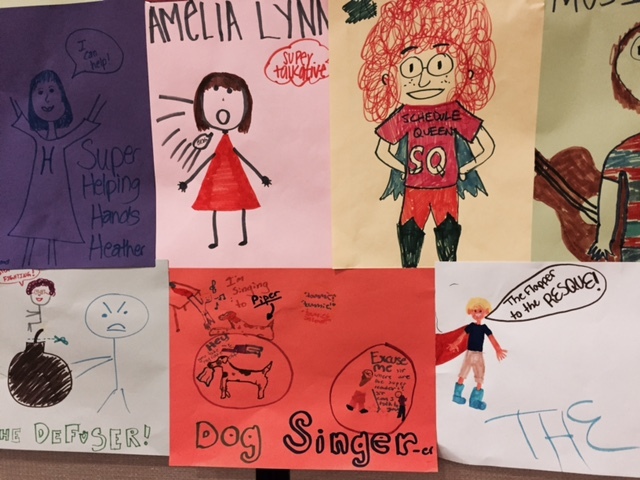 Finally, Avery kept track of weird sightings; unusual things you don’t see every day. Seeking shade in an underpass in Idaho we spotted two llamas being led by two men dressed in Peruvian garb. 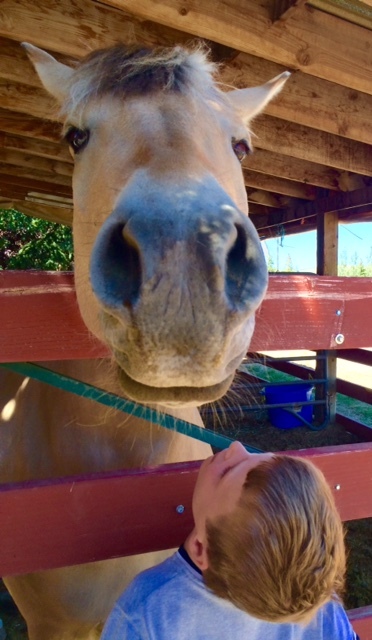 We saw a brick silo, a truck carrying Humvees, a train without any graffiti and a horse herd comprised of faux metal horses posed on a hillside in Montana. But it’s hard to beat the jackalope, that mythical Wyoming creature that’s a giant hare with antlers. As far as roadside attractions went, this gas station in Dubois, Wyo. was the best, symbolizing all that’s weird and wonderful about an American road trip. 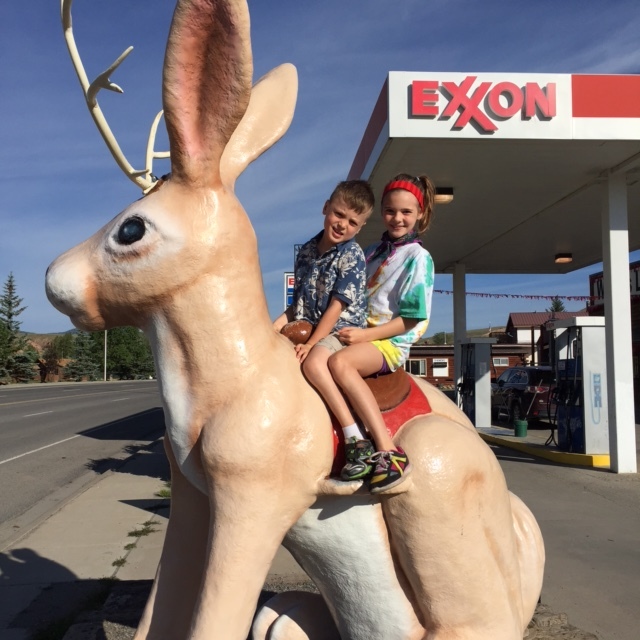 Yes, you can ride the jackalope! Our family has probably spent four of the past five August long weekends in Fernie. Everyone raves about this B.C. town’s epic powder, but the truth is, most folks who come for the winter end up staying for the summer. And we’re no exception — though we love to ski Fernie, we really, really, really like hanging out in this mountain town between Canada Day and Labour Day, hitting Heritage Day in between. 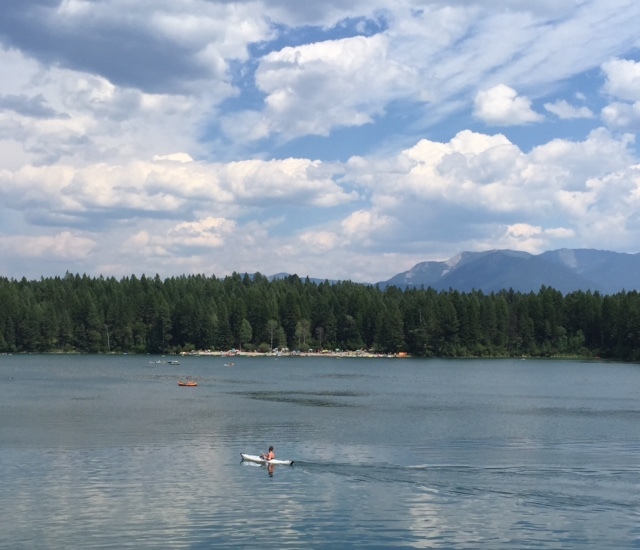 The town of Fernie is great, but nearby Surveyor’s Lake is the place to beat the heat. Warm water, a sandy beach and temps that are usually five degrees hotter! 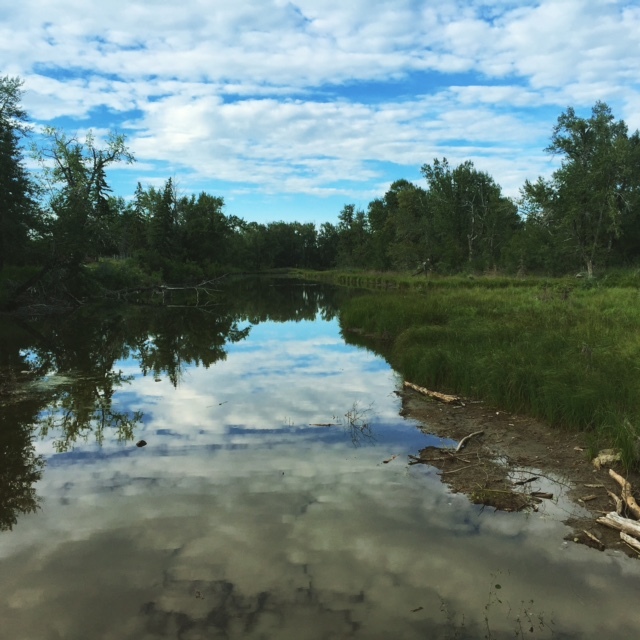 One of our favourite places to spend a lazy summer day is Surveyor’s Lake in Kikomun Creek Provincial Park. The small, natural lake is just a 25 minute drive west of town on Hwy. 3 (turn off just past Hwy. 93 when you see the sign for Kikomun Creek). 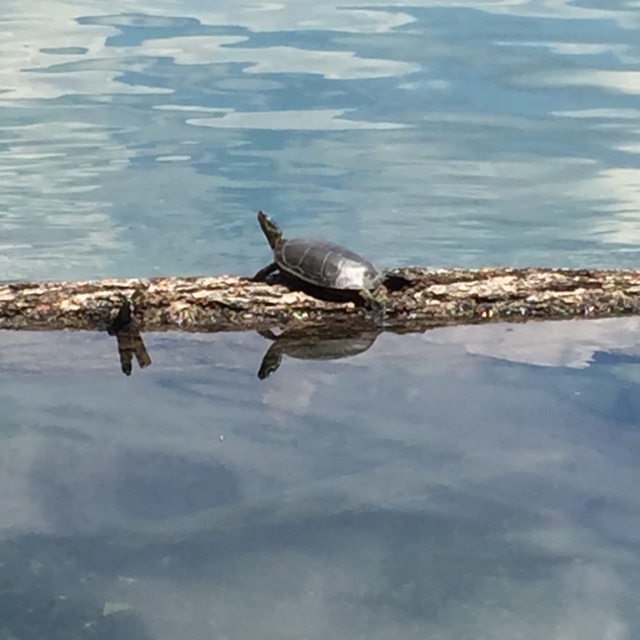 I have written about Surveyor’s Lake and its population of endangered Western Painted turtles before, and we still like to spot them sunning on fallen logs that ring the lake’s perimeter. It’s easy to spot Western Painted turtles at Surveyor’s Lake. But as happens when a spot becomes your “special place” — Blake and I realized that we’ve visited the lake with the kids at least once every summer since 2007, when Avery was two — we’ve fallen into a bit of a routine. We used to rent kayaks from Turtle Haven Rentals, but now that we are spending so much summer time in Fernie we have invested in a large inflatable raft. It’s a bit of a chore for us Blake to pump up this behemoth, but it’s the first thing we he does when we arrive. Then, all aboard for a paddle around to see the turtles, lily pads and loons, and maybe some fishing off the side (catch and release). Bonus: no motorized craft allowed on the lake. 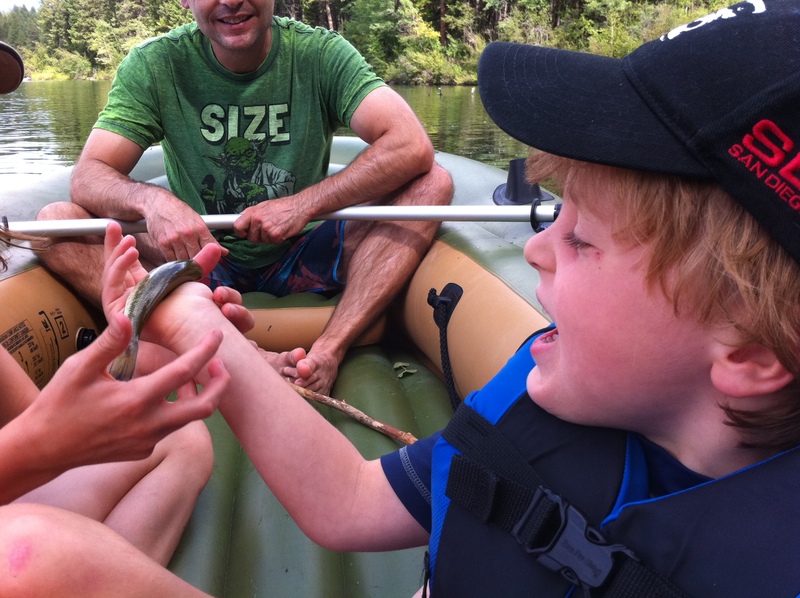 Bennett laughs when Avery lets him hold a fish she caught in neighbouring Engineer’s Lake last summer. When we get back to the beach Bennett goes for a swim. This always includes him climbing up the ladder onto the dock, and then watching other kids jump off into the lake while he works up the courage to do the same. Meanwhile, Avery fishes off the dock, using only a hook as bait. 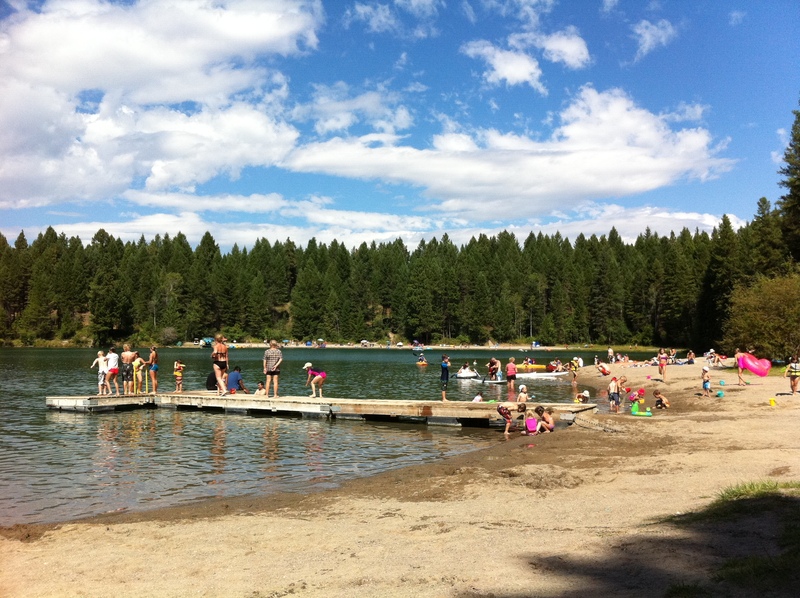 The dock at Surveyor’s Lake is a busy place. 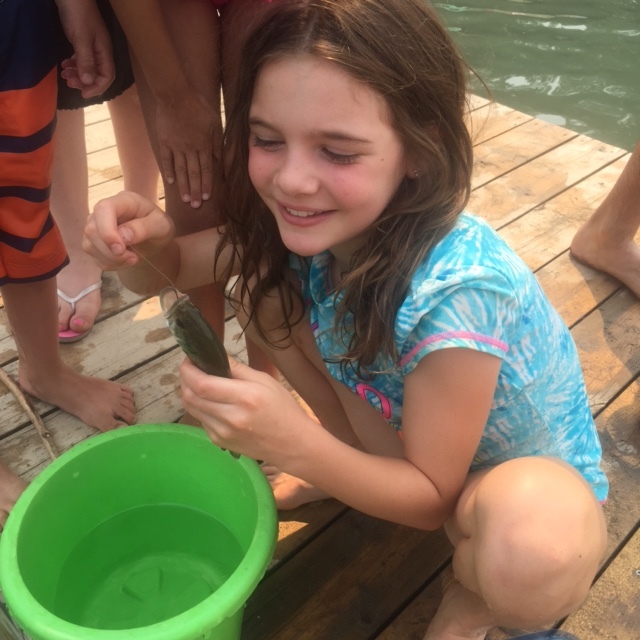 Avery catches another fish off the dock at Surveyor’s Lake. Not long after lunch, just when it’s really heating up, Bennett decides it’s time for the three-kilometre hike around the lake. For some reason I am always the responsible adult that accompanies him on this adventure. He sets a slow pace and we enjoy looking for more turtles and trying to pick out our green and white umbrella from across the lake. 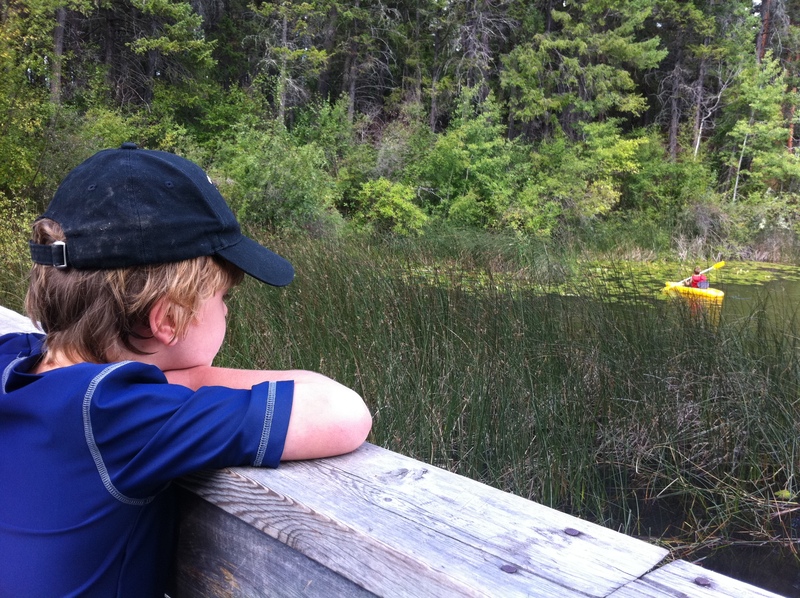 Bennett pauses on the bridge between Surveyor’s Lake and Engineer’s Lake to look for turtles swimming in the water or sunning on logs on our regular hike. At this point, all of the must-do activities have been crossed off Bennett’s check-list and good thing because it’s now about 34C and all anyone wants to do is lounge on the raft while partially submerged (me), play Frisbee (Blake), sit in water-filled sand hollows (Bennett), or build intricate sand castles (Avery). Tada! 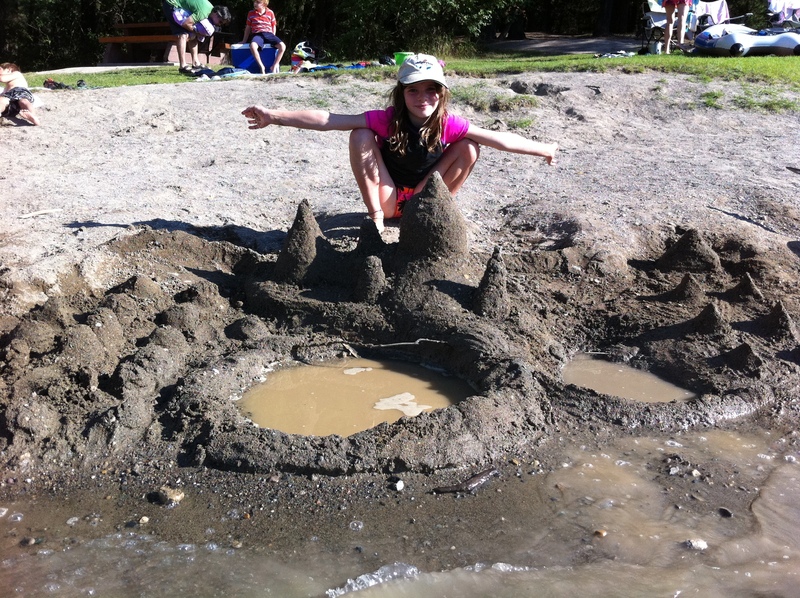 Avery demonstrates her sand castle-building abilities. It’s unbelievably easy to spend an entire day here, holiday weekend or otherwise. Even though we now have an established “lake routine” I can’t imagine I’ll tire of it any time soon. See you later this month, Surveyor’s Lake!